Having insomnia has been associated with poorer reported quality of life, difficulties in interpersonal relationships, and compromised job performance. Moreover, persons with insomnia are more likely to develop serious medical conditions, such as high blood pressure, cardiovascular disease, and diabetes. Therefore if you think you may be suffering from insomnia, it is important to seek the counsel of a qualified healthcare professional. Understanding the different types of insomnia – and the factors that contribute to your condition – can help you and your doctor make good decisions about treatment. Insomnia is readily experienced, but hard to define. Sleep doctors generally point to a dissatisfaction with falling or staying asleep, in a situation in which there is adequate opportunity for sleep. 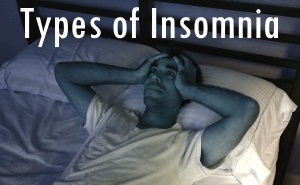 Insomnia may be short-term (acute) or long-term (chronic). To be considered long-term, researchers suggest it needs to occur at least three times a week, for at least three months. Other elements associated with insomnia include a sense of distress, impairment in one’s daytime life attributed to poor sleep, and symptoms that are not better explained by another mental or medical disorder or effects of a substance. The thinking about the relationship of insomnia to other disorders has changed over the years. For a long time, insomnia was described as being of two types: primary (when it occurs by itself) or secondary (when it occurs as part of an illness such as depression or a medical condition). Insomnia is now recognized as a freestanding disorder in its own right. When it occurs in the context of another illness, both need to be treated. Psychophysiologic or Conditioned Insomnia: In this situation, a person may first have trouble sleeping due to some upsetting event. Over time, though, the worry about not sleeping takes on a life of its own, and perpetuates the sleep difficulty. It becomes a little bit like Franklin Roosevelt’s famous saying, "The only thing we have to fear is fear itself." Some therapies for insomnia redesigned to ameliorate this excessive anxiety about not sleeping. Another complication can be that a person begins to associate the bedroom with distress and trouble sleeping, which perpetuates the problem. Some aspects of psychotherapy for insomnia are designed to break up this conditioned response. In stimulus control therapy, for instance, a person is taught to strip the bedroom of all activities except sleeping: no bill paying, no unhappy discussions with a spouse, only sleeping is allowed. Paradoxical Insomnia: Here a person sincerely describes having great difficulty going to sleep, or having very short sleep, but when their brainwaves and other physiological measures are studied in the laboratory, their sleep is relatively normal. The paradox is the difference between what the person feels, and what is detected by objective measures. There is, then, some kind of discrepancy between what a person experiences, and what the sleep study suggests. This difference is not well understood, but research suggests that one element may be a kind of over-arousal in the nervous system in general. A related idea is that there is decreased 'local sleep' in parts of the brain involved with awareness. These notions are supported by the finding of increased metabolic rate in some portions of the brain in persons with insomnia who overestimate their sleep onset time relative to the sleep study measure. Persons with insomnia whose sleep duration is relatively normal may also differ in some important ways from those in whom the sleep study records significantly shorter sleep time. This latter insomnia-with-short-sleep situation may be more associated with some of the medical risks associated with insomnia. Idiopathic Insomnia: Ideopathic is a word for the cause being unknown. A person with idiopathic insomnia has a history of sleep disturbance going back to childhood, without a recognizable upsetting event having occurred. No conditioning qualities, as seen in psychophysiological insomnia, are evident, and the sleep disturbance is relatively constant regardless of varying levels of stress. One thing that is clear is that insomnia is a disorder 24 hours a day. Some studies show that many persons with insomnia, though they feel tired and fatigued, actually have more difficulty falling asleep during the daytime than persons who sleep well. This article on the different types of insomnia is written by Wallace B. Mendelson, M.D. Dr. Mendelson is a psychiatrist, sleep specialist, and author of the book Understanding Sleeping Pills, available on Amazon.com.